Find Your Favorite Style of Home Decor. One of the first steps to designing our home and the rooms within is to hone in on the styles we want the space to reflect. Most often, though, when it comes to home décor, we often are more certain of what we don’t like, than what we actually do like. Often our inability to define our style can be a frustrating stumbling block in our design project, keeping us from creating a comfortable home or just a room to enjoy. 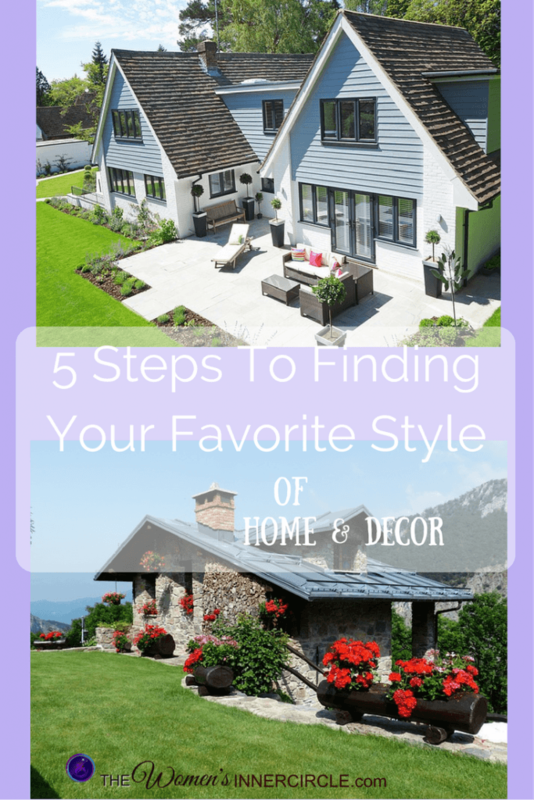 Many of us like different styles, and are just not sure of which style we want to actually live with. One way to get a better feeling for what style you might like best is to simply go “window shopping”. Try going online to the many home décor website or specific manufacturers and just browse through the collections of furniture and accessories. Another way is to go to an actual retail store and walk the showrooms and really look at what you see. Take a pad with you and even snap some photos with your smart phone or camera. You will be able to analyze these photos later at your leisure and convenience. And on of the best way, and my favorite, is to settle in to your most comfortable chair with a pile of home décor magazines and tear, tear, tear the photo out that strike you with the thought “I really like this. I could live with this”. Sometimes these photos are the best way to go, since the furniture is show in a setting which illustrate many of the other items in the room which work together to create a pleasing space. cherry wood, brass elements. In your “Do Not Like” list, you might put items such as chorme, stainless steel, straight legs, no ornamentation, and the like. Going through this exercise is sure to give you information about your style direction in virtually black and white. Once you get a better idea of where you are on the traditional, transitional, contemporary spectrum, I suggest using my 80/20 rule, which makes it even easier to get a project going. This simple rule is: stay within your preferred style for 80% of the elements in the room and then you go “off Broadway” for the remaining 20%. So, if you really think you like traditional styling and furniture best, then go with that…for the majority of the items in your room. That gives you the freedom and flexibility to add in a small amount of “other” styles, giving the impression that your room is not rigid and so it does not look overly “eclectic. Mixing too many styles together, on a cautionary note, may lead to a room that looks disorganized and assembled randomly with things you just fell in love with and had to have. There is nothing wrong with bringing home a great find that you just can’t live with, but select these with discretion, so that your final result looks well intended. The style you emphasis in your project not only involves your furniture, but also the selections of fabrics, window treatments, and your choices for lighting and accessories, to name a few. So honing in on your basic style is most important and will definitely drive the design. There are three basic styles in design, which many of us are already familiar with: traditional, contemporary, and transitional. Again, once you select the primary style, feel free to add in elements of the other two, so your room has interest and variety. Traditional styling is probably the one that is the most common and which many of us grew up with. Originating in Europe, traditional furnishings come from England (think Queen Anne), Italy (think Tuscan style), and France (think French Provincial). Common elements of the traditional style are details in ornamentation, curved lines, inlays of marble and wood, the use of turned legs and carved corbels or brackets. Contemporary and modern styles are cleaner, straighter and often incorporate glass and metal. Contemporary, less severe than modern, contains more curvilinear lines. Contemporary styling has straightened out the lines of traditional, while keeping some soft curves here and there, without going to the extreme of modern styling, which is noted by more severe straight lines and cool elements of metals and leathers. Transitional style is the bridge between both traditional and contemporary, keeping many of the original elements of traditional, but with a more modern twist, keeping the true traditional elements to a minimum. Transitional styling can be described as “traditionalized contemporary” or “modernized traditional. If you like both traditional and contemporary styles, you might just chose the transitional style, which makes it simpler than attempting to mix traditional and contemporary pieces, which can yield a result that looks like you just didn’t know which fork to take on the yellow brick road to design.